We continue our series of reports on the fascinating variety of world music instruments with an article by Merja Soria, CWM teaching artist, and player of the kantele. Sing the song of Kantele! The kantele belongs to a large family of string instruments called zithers. Zithers have a resonating body with a variable number of strings, which can be plucked, strummed, struck, or bowed. In the case of the kantele, the strings are plucked or strummed and the smallest kanteles can be held in the player’s lap. The kantele is the national instrument of Finland. 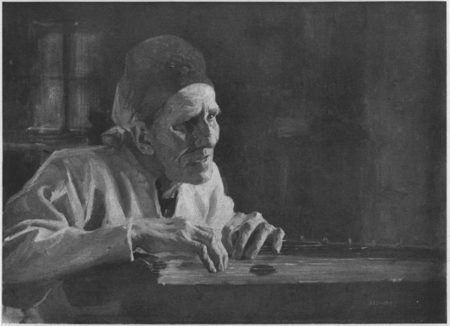 Finnish folk poetry recounts that the first kantele was made from the jaw bones of fish and the hair of young maidens. When the first kantele was played, the sound was so beautiful that all living things started to cry. Their tears rolled into the ocean, and when they touched the sea they turned into beautiful blue pearls. 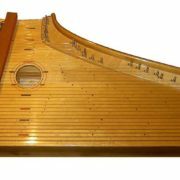 There are kanteles of many sizes: 5-string, 10-string, 11-string, all the way up to the 36-string concert kantele, as seen above. My favorite instrument is the 5-string kantele. It is a very soulful and humble instrument. It teaches you to quiet your mind and allow the kantele to sing its stories–stories of hard winters and beautiful summer nights, stories of a resilient northern nation who fought hard for its independence. You play the 5-string kantele by plucking the strings to create melodies. You can also strum chords by muting the strings that don’t belong to the chord. The strings of this small kantele are tuned to the first five pitches of the major or minor scale. Larin Paraske, one of the great rune singers of Finland. 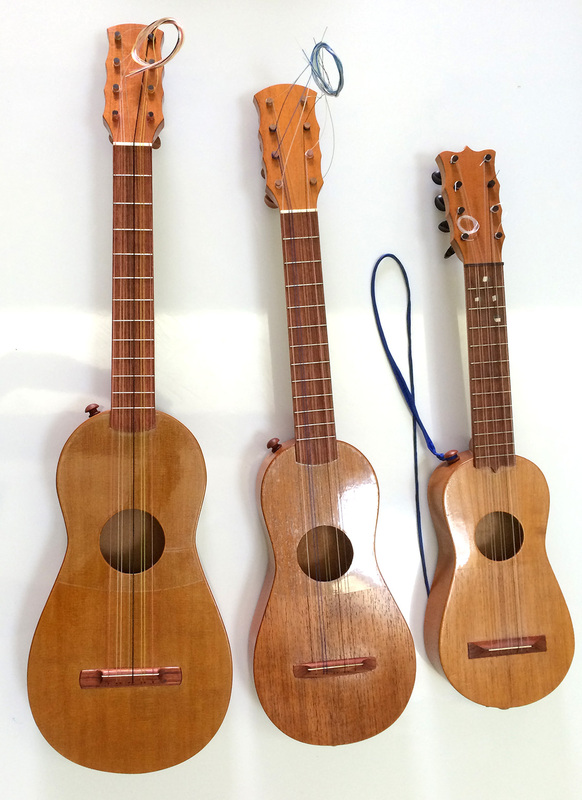 The 5-string kantele is often taught in Finnish schools as the first instrument for young children. It encourages creativity, as it is easy to learn improvisation with this instrument. 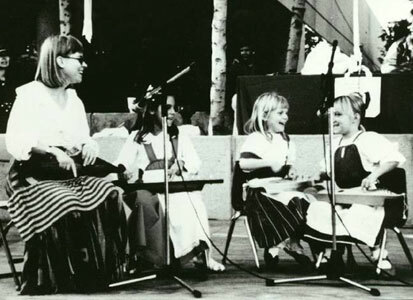 Children find the kantele fun because they experience the joy of playing together as a group. You do not have to be a Finn to appreciate and learn kantele. Merja, with her daughter, and two children. 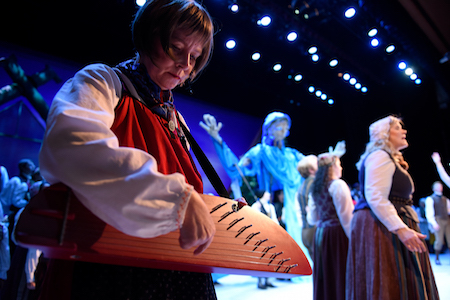 I am a first-generation Finnish immigrant now living in the US, and for me, the kantele and Finnish music are the bridge that connects the two distant worlds. When I close my eyes and let my fingers move across the strings of the kantele, I remember—I remember the Finnish spirit that is in me. The spirit that says keep going and never give up. All the while, singing the song of life through all the difficulties. Sing the song of the kantele! Learn more about Merja at merjasoria.com. View a “vintage video” of Merja performing on a 10-string kantele soon after her arrival in the United States. – Merja Soria is a performer and teacher of Finnish folk music and a Center for World Music teaching artist. 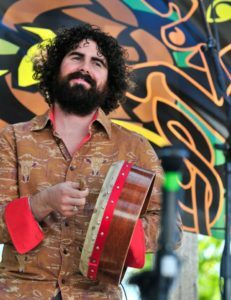 We continue our series of reports on the fascinating variety of world music instruments with an article by Máirtín de Cógáin, CWM teaching artist and player of the bodhrán, or Irish frame drum. When I was a young lad in Cork, Ireland the bodhrán (pronounced bow-rawn, like cow brawn) was commonly considered as the “ancient sound of Irish percussion.” Indeed, we are told that the bodhrán was used to summon the fairies from their magic fort on full-moon nights. Many novice players could not understand why this profound sound of the past was not widely featured in traditional Irish music sessions across the world. After all, they would say, isn’t this “the Irish drum”? Little did we know that the opposite was the case. While teaching bodhrán in upstate New York at the Catskills Irish Arts Week, I sat in on an eye-opening lecture by Fintan Vallely entitled “Hunting for Borr-án: Shaking a Stick at the Origin Myths Concerning the Irish Drum.” My world as a bodhrán player was completely dismantled. Today the bodhrán is a rapidly-developing Irish drum, in both its design and its playing style. It was brought from its humble origins in rural celebrations to public attention in concert halls and theaters by Seán Ó Riada and Peadar Mercier in the 1960s, and featured prominently in the ensembles Ceoltóirí Chualann and the Chieftains. From there it has exploded across the globe and become a mainstay at many Irish music sessions and home fireplaces. Johnny “Ringo” McDonogh is noted as the first player to damp the sound with one hand on the back of the instrument, and many others have further developed this style of two-hand playing. In addition, tunable bodhráns have improved the tone more concretely, and turned the humble farm utensil into a sophisticated musical instrument. At the age of 19, I stumbled into the Douglas, County Cork branch of Comhaltas Ceoltóirí Éireann, a non-profit organization whose mission is to preserve and promote Irish traditional performing arts. It was there that a tiny 6-inch bodhrán with a hole in it was thrust into my hands, and I was steered into a bodhrán class with teacher Eric Cunningham. The rest is history. Today, I play a 14-inch Metloef bodhrán, although many instruments of old were 18 to 20 inches in diameter. According to Fintan’s research, those larger sizes were prevalent because old spinning wheels were used as the rim of the instrument. Personally, I find the larger diameters too cumbersome, although other players still prefer them. Two pieces of wood in the shape of a cross, placed within the back-side frame are common in the larger drums, but I feel that they are a hindrance to playing the smaller instruments that I prefer. In the past, the performer’s bare hand was most commonly used to beat the drum, as demonstrated by the great Rónán Ó Snodaigh. Nowadays, however, a stick called a cípín is typically used. Ideally, the cípín matches the length of the player’s hand, from outstretched thumb to outstretched baby finger, as this is about as much weight as any one’s wrist can withstand for extended playing. When both ends of the cípín are used, this is known as the “Kerry” style of bodhrán playing. A different style, known as “top end,” uses only one end of the stick and is characterized by a heavy emphasis on upstrokes of the cípín. —Máirtín de Cógáin is an actor, singer, percussionist, storyteller, playwright, dancer and teaching artist in residence for the Center for World Music. We continue our series of reports on the fascinating variety of world music instruments with an article by Randin Graves about the Australian Didjeridu. The didjeridu (or didgeridoo) is a deceptively simple instrument in construction. Nevertheless, it can produce extremely complex music in the hands of an expert player. It is simply a tube with no reed, finger holes or moving parts of any kind. The player creates rhythm and shifts of timbre and pitch with movement of the breath, lips, tongue, cheeks, throat, vocal cords, and stomach muscles. “Circular breathing” is employed to produce continuous sound, whether a simple drone or an intricate rhythm. A rough map of the origins of the didjeridu. Aboriginal people of northern Australia invented the instrument and still use it in ceremony and daily life today. Didjeridu is not in fact an Aboriginal term, but an onomatopoeic word created by European settlers describing the sound produced by traditional players. There are many words for the instrument in Aboriginal languages. 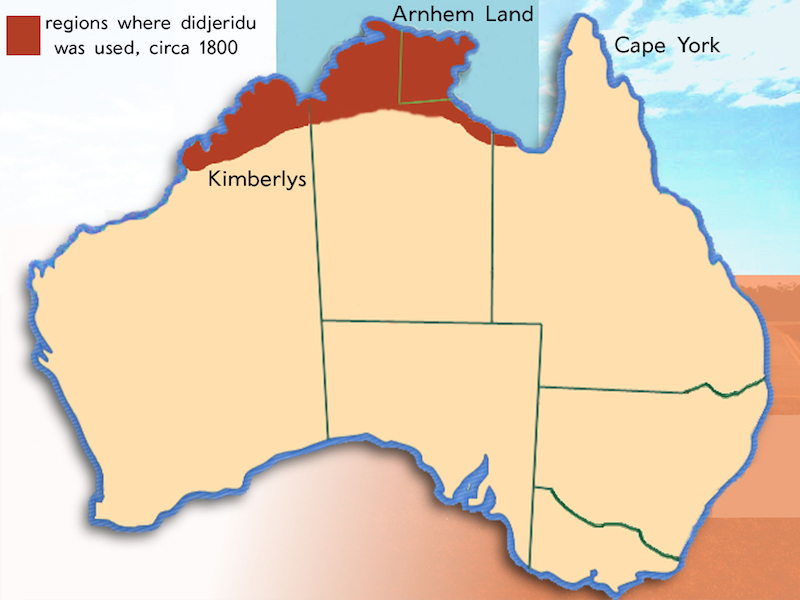 The best known around the world are yidaki from northeast Arnhem Land and mago from west Arnhem Land. In both regions, it is also common to hear the word bambu used. Bamboo was occasionally in use at the time of European contact, but has now fallen out of favor with Aboriginal players. 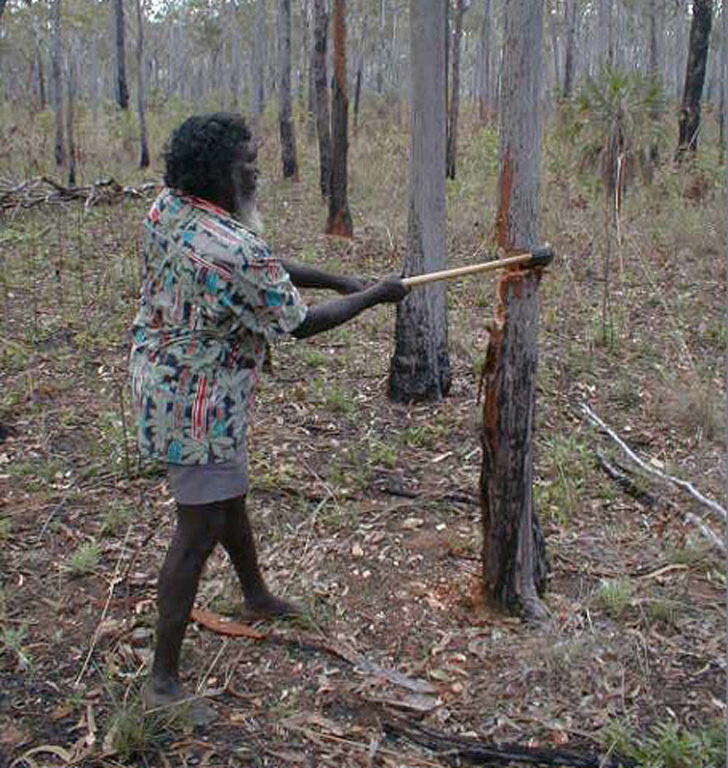 Djalu Gurruwiwi begins chopping down a stringybark tree (Eucalyptus tetradonta) to craft a didjeridu. These days, people around the world make didjeridus out of a wide variety of materials. Traditionally, however, instruments are made from trunks of eucalyptus trees that have been hollowed out by termites commonly known as “white ants.” A craftsman scans a forest for likely instruments, then taps a tree up and down to evaluate the hollow inside. If it sounds good, the tree is felled, cut to length, stripped of its bark and carved down to match the interior hollow. If the natural hollow of the wood at the top is too big or irregularly shaped, a material found in bee nests called “sugarbag” is formed into a mouthpiece. Sugarbag is a black, gummy substance native Australian bees make by mixing their wax with eucalyptus tree resin, not the yellow wax of European bees that is often seen on instruments made for the tourist market. 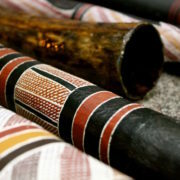 Instruments made for sale or special ceremonies may be elaborately decorated with clan designs related to the artist, but most didgeridoos in everyday use in northern Australia are unpainted or wrapped top to bottom in duct or electrical tape to hold them together through inevitable cracking as the wood dries. 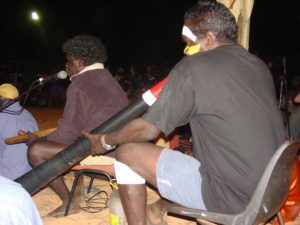 Milkay Mununggurr accompanies ceremonial song with a didjeridu completely wrapped in tape. Traditional Aboriginal players continue to use age-old tonguing techniques that stem from their language and are foreign to most outsiders. As the instrument has spread globally, many more styles have developed around the world, from new age drones to beatboxing, in both solo and ensemble settings. — Randin Graves is a composer, multi-instrumentalist, and one of the world’s leading non-Aboriginal exponents of the Australian didjeridu. For more information on the didjeridu at its origin, visit YidakiStory.com, which Randin created in collaboration with many Yolngu Aboriginal people as part of his Fulbright Fellowship and Master’s Degree project. Get hands-on instruction on the didjeridu with Randin Graves on Saturday, February 11 at 11AM. We continue our series of reports on the fascinating variety of world music instruments with an article about the jakhee, an instrument used in Thai and Khmer music. The jakhee (จะเข้) is a plucked string instrument with three strings and eleven wooden frets, found in Thailand, Myanmar, and Cambodia. 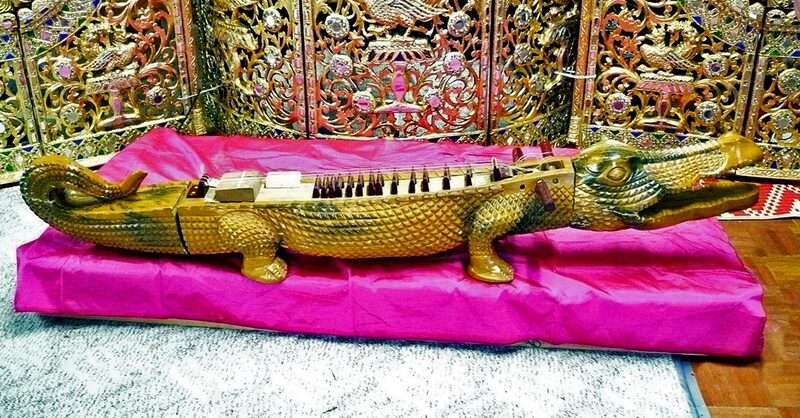 The name is derived from the Thai word for crocodile, jaurakhee, because the body of the instrument is shaped like a crocodile, and it is sometimes elaborately carved to represent one. The body is made from wood, often from the jackfruit tree, carved out of one piece and covered with a flat lid on the bottom which has sound holes and five short legs. To play the jakhee, the player tightly ties a large pick to their right index finger. The right hand rests against the body of the instrument and the hand rocks back-and-forth over the strings in an arc-shaped motion, plucking strings individually or strumming across all three. The pick is often made from hardwood, bone, ivory or ceramic. The instrument itself can be decorated in elaborate patterns with gold paint, mother-of-pearl, lighter colored wood trim, bone, white resin or ivory. It has two silk or nylon strings, tuned to Do and Sol, and one metal string tuned to Do an octave lower, and they are strung over a curved bridge that gives the instruments a buzzing timbre, similar the javari bridge on Indian instruments such as the sitar. Traditionally, a player sits with legs folded back to one side on the floor behind the instrument, but today it is common for the instrument to be elevated so the player may sit on a chair. 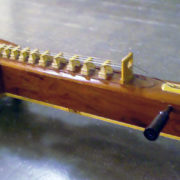 The jakhee is often played as a solo instrument, but it is also found in classical ensembles, including the khrueang sai (stringed instruments) and mohoorii ensembles. The stringed ensemble consists of one jakhee, one sau duang (two-stringed hardwood fiddle with python skin), one sau uu (two stringed fiddle with coconut shell body covered with cow skin), one khlui (wooden vertical flute), thoon-rammanna (a set of two drums), and ching (cymbals). It originated in the royal palace and is often used in entertainment settings, at schools, universities, communities, and temple festivals, and funerals. Another, much rarer, kind of ensemble combines the small stringed instrument ensemble with quadruple-reed oboe and a pair of drums (klaung khaek). It is called khrueangsai pii chawaa, or stringed instrument ensemble with Javanese oboe. This ensemble is closely associated with royalty and plays both entertainment and ritual music, and was the subject of my Ph.D. dissertation at the University of California Riverside, entitled Music for the Few: Nationalism and Thai Royal Authority. 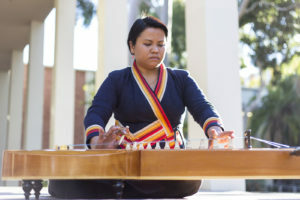 Supeena Insee Adler demonstrating the jakhee at UCLA. View here. Chin Kim Yai performed by Saharat Chanchalerm and orchestra at the Thai Cultural Center in Bangkok, Thailand. View here. Thirty-five jakhee players perform at the funeral of their music teacher, khruu Thaungdii Sujaritkul. View here. A khrueangsai pii chawaa ensemble performing at Chulalongkorn University, Thailand. View here. —Supeena Insee Adler, Ph.D., is a lecturer at UCLA, ethnomusicologist, performer, and a volunteer Thai music teacher at the Thai Buddhist Temple in Escondido, California. We continue our series of reports on the fascinating variety of world music instruments with an article about the Norwegian Hardanger fiddle. The fiddle is one of the most common instruments, found in one form or another in nearly every part of the world. It is best known today as the violin, which found its present form in sixteenth-century Italy. Other bowed instruments have emerged in a range of cultures from Iceland to India. One of the most charming, both in the auditory and the visual sense, is the Norwegian Hardanger fiddle (also known as the hardingfele). 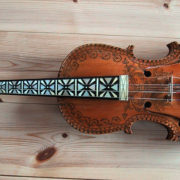 This close cousin of the violin developed in the Hardanger district of western Norway, southeast of the port city of Bergen. It was developed by makers who probably combined aspects of the old Norse fiðla with the viola d’amore, one of the relatives of the violin. It seems to have first appeared in the 1600s, and quickly became popular throughout the region. Isak Neilsen Skaar and his son Trond Isaksen were two well-known early makers of the instrument. During the period from 1825 to 1875, the Helland family of Telemark brought the fiddle to its highest point of development. Jon Erikson Helland and his sons Erik Johnsen Helland and Ellef Johnsen Steinkjøndalen brought an exceptional degree of craftsmanship and artistic ability to their fiddlemaking, and incorporated a number of worthy improvements. Several features make this instrument distinctive to Norway: the use of eight strings (only four of which are played with the bow; the other four vibrate sympathetically), the dragon’s head in place of a scroll, the overlapping f-holes, and the lavish use of inlay and decoration. Many fiddles have elegant floral drawings covering their surfaces, and often the peghead is detailed with gold leaf. There are also important structural differences, among them a lack of interior linings, very small corner blocks, and a bass bar which is carved into, not glued to, the sound board. 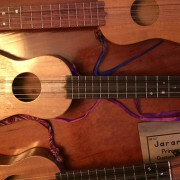 The fingerboard and bridge are often nearly flat, allowing the player to bow more than two strings at a time. The hardingfele is played in a variety of tunings; among them the common violin tuning GDAE (low to high) with the sympathetic strings tuned DEGA. Another is ADAE with DEF#A. The sympathetic strings give this fiddle’s sound a delightful coloration, with dark, shimmering undertones. The folk fiddling of Norway draws one back to a simpler time, to a time of hard work at the loom or in the forests and fjords, of long winter evenings spent singing around the central fireplace, and of solemn processions and joyous wedding feasts with family gathered from afar. For more information on recordings, performances, instruments, and strings, visit the Hardanger Fiddle Association of America at http://www.hfaa.org. — Jonathan Parker is the World Music in the Schools program director for the Center for World Music. This article appeared in slightly different form in the November 1989 issue of the San Diego Folk Heritage journal Folk Notes. 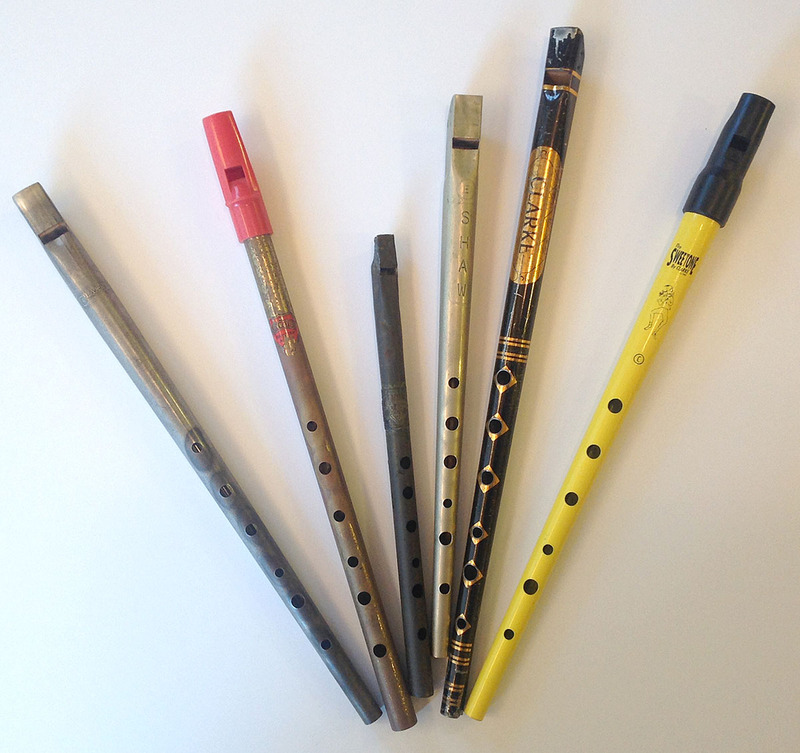 We continue our series of reports on the fascinating variety of world music instruments with an article about the tin whistle by Jonathan Parker, program director for the World Music in the Schools program. An instrument with an ancient and enduring history, the tin whistle (or penny whistle) is one of the most misunderstood and maligned of wind instruments. Often mistaken for a toy, this flute is, in capable hands, one of the most expressive and delightful of traditional musical instruments. Originally made from a hollow bone, such as that of a bird’s wing, the tin whistle is a type of instrument known as a fipple flute, and is identical to the flageolet in its earliest form. As its name implies, it later came to be made of tin, and was first mass-produced in this form by Robert Clarke around 1840. Examples of bone whistles dating from the 12th century have been unearthed in High Street, Dublin, Ireland. The tin whistle is, in physical terms, one of the simplest of instruments. 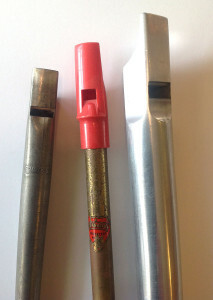 The mouthpiece has a narrow windway, an opening or “window” cut in to the side of the instrument, and a sharp edge over which the player’s breath passes. 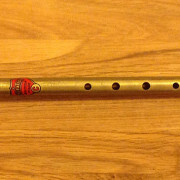 The instrument has six front fingerholes and no thumbhole, distinguishing it from the recorder. 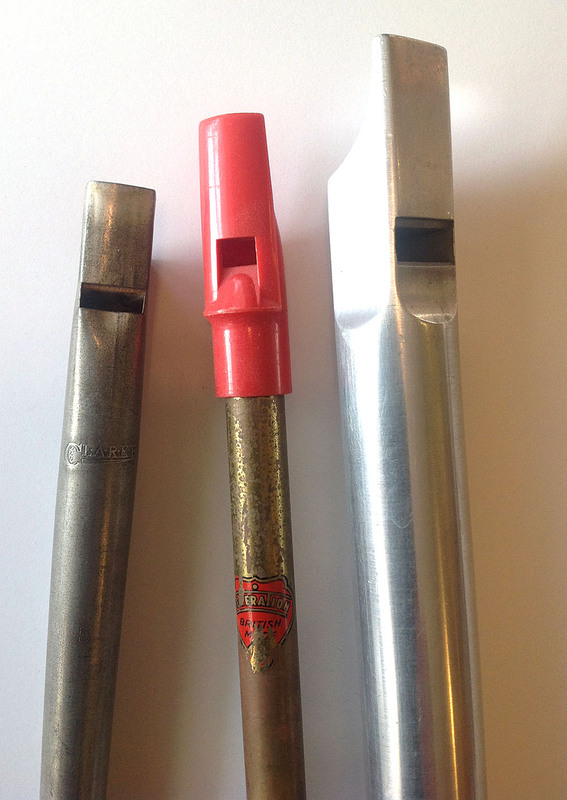 The bore was often conical in older instruments (typified by the English-made Clarke tin whistle), while many modern whistles have a cylindrical tube and a plastic mouthpiece replacing the older wooden or lead plug. In recent decades, this instrument has been made from a wide variety of materials, including exotic woods, PVC plastic, aluminum, brass, composite materials, and even sterling silver. Players of the tin whistle range from the 17th Century English diarist Samuel Pepys, who wrote of his delight in playing the “flagilette,” to the great modern Irish flautist James Galway. 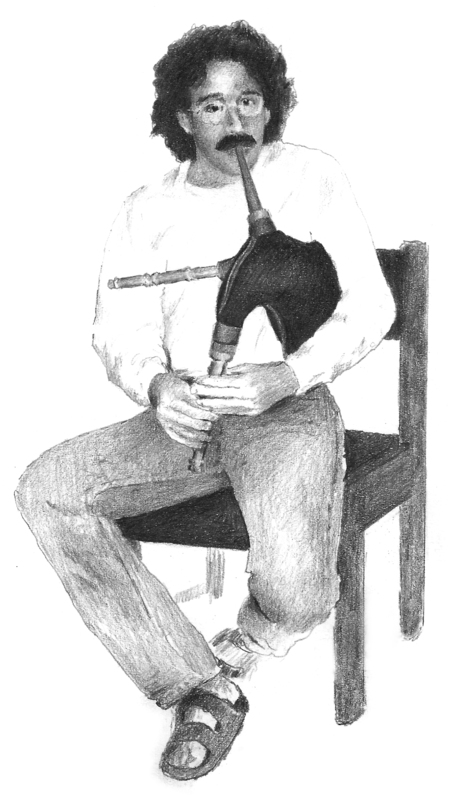 Many Irish flute players and uilleann pipers have played the tin whistle as a secondary instrument, including Willie Clancy, Paddy Moloney, Joanie Madden, Liam O’Flynn, Michael McGoldrick, and Mick O’Brien. Among the best-known contemporary players of the Irish tin whistle are Cathal McConnell, Mary Bergin, and Brid O’Donohue. Deceptive in its simplicity, the tin whistle is one of the most accessible and portable of instruments, and one of the grandest in character. — Jonathan Parker, the World Music in the Schools program director for the Center for World Music, has played the tin whistle since 1980. This article appeared in slightly different form in the July 1990 issue of the San Diego Folk Heritage journal Folk Notes. We continue our series of reports on the fascinating variety of music instruments that students in World Music in the Schools enjoy with the tamborim. The tamborim is a Brazilian drum of Portuguese and African origin. 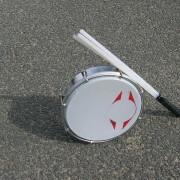 It is a small handheld frame drum used in samba, pagode, bossa nova, choro, and other Brazilian folk rhythms. It is typically made of a metal frame with a nylon or plastic head, although it can also be made of wood or plastic with an animal skin head. Because of the similarity between their names, it is often confused with the tambourine, a frame drum with metal jingles around the perimeter found in much music around the world, including the United States. 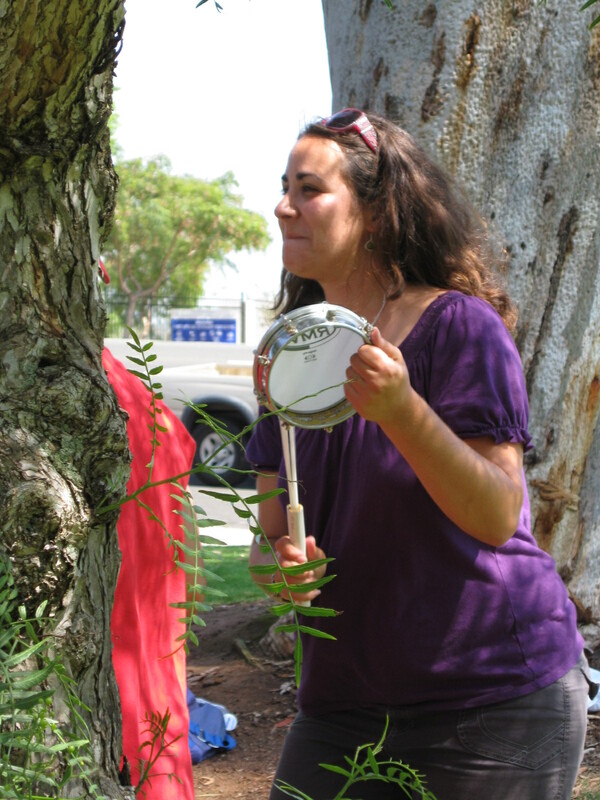 The tamborim can also be confused with the pandeiro, the Brazilian version of the tambourine. 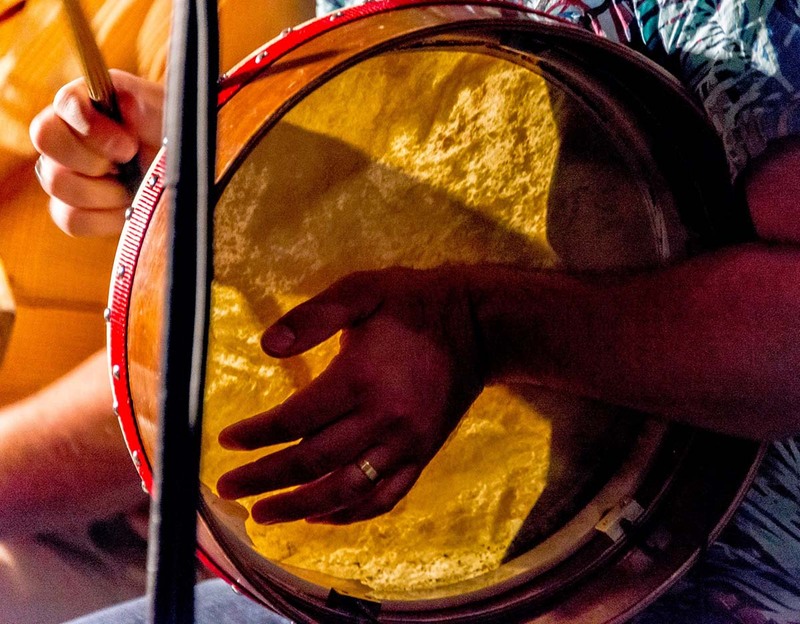 Unlike the tambourine, however, the tamborim has no jingles and is played with a wooden stick, a finger, or a bundle of long flexible nylon rods that strike the head all at once. It typically plays a punctuated syncopated pattern that fits with the other interlocking rhythms in an ensemble. 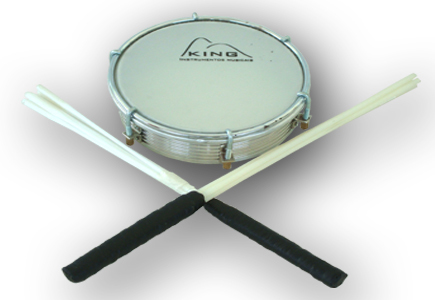 In a Brazilian Samba School setting, metal frame/nylon head tamborins (plural spelling) are played with the bundled-nylon rod baqueta. The resulting sound is a loud, high-pitch “CRACK” that cuts through the din of the other drums, making ear plugs a necessity. The tamborins in the Samba School maintain the underlying groove of the samba rhythm by playing carreteiro, which in Western musical terms is a constant series of 16th-notes played with a Brazilian “swing.” They manage to keep up with the rapid samba tempos by flipping the drum up and down so that the striking hand is not doing all of the work. When the tamborins are not playing carreteiro, they are playing desenhos (“designs”) which are unique rhythmic patterns that give the samba a special personality. Each Samba School has its own unique desenhos that are sometimes accompanied by choreographed movement. This instrument creates an exciting transition when the Samba School starts up, and a few moments later the tamborins make their big entrance and take the music to the next level! 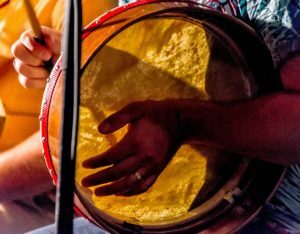 We continue our series of reports on the fascinating variety of world music instruments with an article by Christopher Adler, Ph.D. The khaen is a free-reed mouth organ of the Lao people who live primarily in lowland Laos and the Northeastern region of Thailand (also called Isaan). The instrument consists of two rows of bamboo pipes that are mounted in a wooden windchest. The number of pipes can be between six and eighteen, but the most common form has sixteen pipes. Into each pipe is set a piece of flat metal with a tongue cut into it—this is the free-reed that vibrates whether the players blows into, or draw air out of the instrument, producing a continuous sound. Each pipe has a small finger hole near its reed that acts as an air escape valve, preventing the pipe from sounding unless covered by the player. And so the instrument can sound as many pipes as the player can cover, making it a polyphonic instrument—although the conventional musical texture is a combination of one or more sustaining drones with a melody that may be ornamented or harmonically embellished. A spirit healing ritual in Northeast Thailand. Photo by Supeena Insee Adler, used by permission. As a native instrument with rural origins, unaffiliated with elite royal cultures in the region, the khaen is upheld as a symbol of Lao cultural identity throughout the region and among the Lao diaspora worldwide. 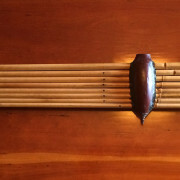 The instrument has also been adopted by other ethnic groups in Thailand, Laos, and Cambodia, and is closely related to other free-reed mouth organs found throughout East and Southeast Asia. 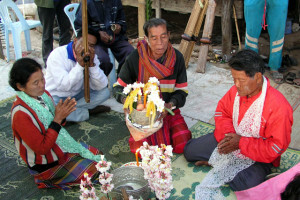 Among the Lao, the khaen is traditionally played by both amateur and professional musicians to accompany solo singers called maulam in entertainment settings and sometimes also in spirit rituals. The music can be heard at temple festivals, in local markets, and in professional concerts, and is also taught in public schools and universities. Traditional performance genres are still maintained but are less popular than newer contemporary folk-pop fusions. A maulam singer and dancers accompanied by a pong lang ensemble in Northeast Thailand. Photo by Mahasarakham University, used by permission. One such modernized form includes the khaen along with newer folk instruments as accompaniment to dance or singing. This ensemble, known as wong pong laang, is ubiquitous in Northeast Thailand at schools and universities and is presented nationally and internationally as a musical symbol of the Isaan region. 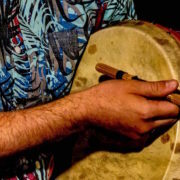 The khaen is also found in folk-pop fusion genre called lam sing, where the instrument appears as a visible sign of ethnic and regional identity, but is often sonically overwhelmed by other amplified instruments. — Christopher Adler, Ph.D is a former board member of the Center for World Music, and is a composer, performer and improviser living in San Diego, California. In addition to being a Professor at the University of San Diego, he is internationally recognized as a foremost performer of new and traditional music for the khaen. We continue our series of reports on the fascinating variety of world music instruments with an article by Jonathan Parker. When we think of bagpipes, most of us envision the Scottish Great Highland warpipes played by brawny, kilted men with red moustaches, marching in echelon. Indeed, the Highland pipes are known the world over, due to the regiments of Scots sent throughout the British empire in the 19th and early 20th centuries. What few people recognize is that this instrument is only one of a very large family of musical instruments, played in dozens of countries. There are bagpipes from India, Persia, Bulgaria, North Africa, Russia, Italy, France, England, Ireland, Spain, Estonia, Poland, and Germany, to name a few. Many countries even have several; France has at least ten, and Scotland has no less than three distinctly different types. Altogether more than one hundred kinds of bagpipes exist, each with its own performance tradition and repertoire. Today we’ll take a look at one of the farthest-flung of these, the Swedish säckpipa. As with many varieties of bagpipe, this humble instrument was played largely in the rural parts of the country. 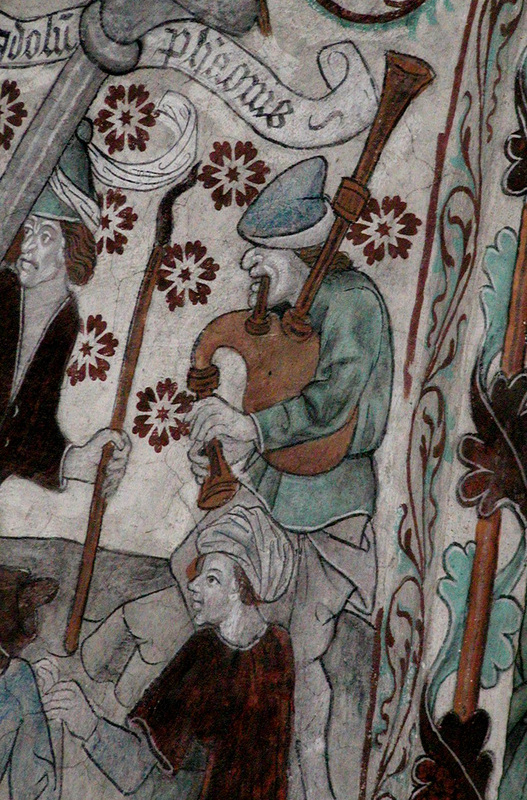 One early depiction of a bagpipe in Sweden is from around 1480, in a painting by Albertus Pictor in Härkeberga church in Uppland, although the form of the instrument he depicted suggests that its origin may be different from the surviving historical examples of the säckpipa. 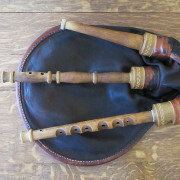 Also played for dancing, the säckpipa harmonizes well with the fiddle, but it was usually played as a solo instrument. It is mouth blown, having but one drone and a chanter with a compass of eight notes. Known in different parts of Sweden as dråmba, koppe, posu, or bälgpipa, its sound is quite sweet and about the same volume as a fiddle, making it an agreeable indoor instrument. Instrument makers constructed the pipes from birch wood, with a calfskin bag, and sparingly decorated it with hand-carved ornaments. The reeds were made from Phragmites australis, the common pond reed, harvested in the winter and chopped out of the ice. Some early examples also have a second “dummy” drone, which is not drilled and has no reed. 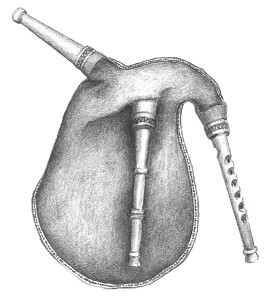 The säckpipa seems to be most closely related to the Eastern European bagpipes of Bulgaria and Macedonia, with a cylindrical chanter bore and reeds of the single blade type. This should not be too surprising, considering that Scandinavians traded, battled, and marauded all the way down to Constantinople, in what is now Turkey. The säckpipa has recently undergone a rebirth, having been taken up by many young musicians over the last few decades. The last piper, or pösuspelman, in an unbroken tradition was Gudmunds Nils Larsson of llbäcken in Dala-Järna, who died in 1949. Fiddler Per Gudmundson, at the urging of Gunnar Ternhag of the Dalarnas Museum in Falun, decided in 1981 to reconstruct the instrument and its musical repertoire. Woodworker Leif Eriksson was asked to help, and he and Gudmundson replicated the instrument based on examples found in museum collections. Together they worked out the details, and built a working set of pipes. Per went on to research the available written and recorded music, taught himself to play the instrument, and recorded an album in 1983 which has become a classic volume, Per Gudmundson: Säckpipa. This LP was rereleased in CD format in August 2015 on Caprice Records. Since its revival in 1981, a number of other makers have begun building this instrument, and there are now hundreds of active players in many countries. For more information about this instrument and how it has developed since this revival, visit Olle Gällmo’s säckpipa website. — Jonathan Parker is the World Music in the Schools program director for the Center for World Music, and has played the säckpipa since 1986. Illustrations are by Paul Johnson; Olle Gällmo provided the photo from Härkeberga church and other valuable support. This article appeared in slightly different form in the September 1990 issue of the San Diego Folk Heritage journal Folk Notes.